The Janabalaya Colombata campaign of the JO on 5 September was essentially a mass-ferrying of humans in buses from outstations. 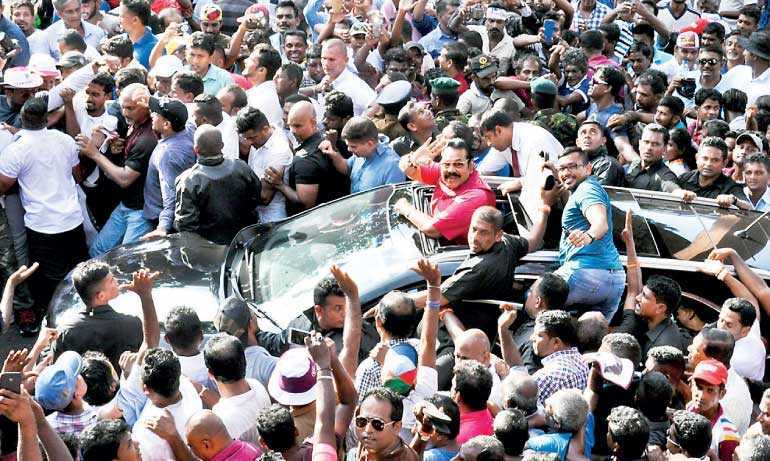 Organised by Namal Rajapaksa and other JO leaders, the project was led and driven by a Mahinda Rajapaksa elite or coterie and remained that way until it came to a lack-lustre closure with the former President himself making an aimless and senseless speech from a vehicle. One could observe, Mahinda was tired and jaw-dropped. If a mass protest were to be successful that has to generate from the masses themselves who perceive a compelling necessity to get mobilised and to sacrifice for a cause. An individual’s choice is generally based on a hidden processing of costs and benefits. We observed that in Arab Spring. Janabalaya Colombata was a far cry from Arab Spring. The inability to comprehend the difference in the two situations led to a wasteful exercise. The Daily Mirror editorial referred to Mahinda as a ‘sharp thinker’. Oh my God! What sharpness was that? There is no denying that the crowds were big but there isn’t any agreement about the size of that attendance. I guess that the selection of the Lake House roundabout as meeting centre could not have been made if the crowds had been huge like in the last May Day of the JO. In the Lake House roundabout area even a crowd of around 3,000 can impress. The missing hand of Basil Rajapaksa was conspicuous. Namal Rajapaksa is said to have been the chief organiser as apparently the former President wanted him to show his metal in order to establish his credibility for Presidential candidacy. Namal hardly qualifies for that responsibility. Namal will have to go back to the working board and learn his sums. One youngster from Hatton, 38 years old, had a heart attack and died. Drowning the pathos of souls lost in drink, fallen by the wayside had been the dominantly celebratory mood of large blocks of people who kept dancing and merrymaking with the Papara Papara band fully in action. Obviously the masses who attended hadn’t taken the event with the seriousness of a rebellion to overthrow the Government. They had a real go at it and returned home. This is the thing I want to say: The spirit of the people hardly evinced a seriousness or tension that rebels would necessarily exhibit. In general terms, there was no mood of potential violence, urgency or anger noticed. Nobody seemed keen to tear down the Government – except the organising elite – the Rajapaksa family and cohorts. I like to pause here and raise a question for the Government: Should these kinds of protests be allowed to be carried out this way with disruptive impact on peace-loving citizens? Should there be no preconditions and regulations laid down before permission is granted? For instance, the organisers had not announced the routes that were planned. This is clear violation. Routes to be taken must be announced. This would enable the police to be in readiness to ensure the protection of both protestors and civilians simultaneously. No Government can carry on in this fashion and the whole rough business drives the wrong messages to business circles. The Government wasn’t overthrown but the Government loses its hold in the public imagination in some unspeakable fashion. There is also a lesson for the Joint Opposition: The latter got to consider why Janabalaya did not engage the population at large. The answer is simple: The people perceived no reason to join in. Janabalaya did not excite the public imagination as it was perceived as something done by a Rajapaksa elite for their benefit. Even the large numbers of supporters that Mahinda Rajapaksa still has in the country did not get stimulated by any prospect of the Government getting ousted. The fundamental thing is that this Government is in no sense an oppressive government ever ready to crush dissent. One of the principal achievements of Yahapalanaya is the liberal atmosphere and freedom of the individual that it has provided. There are no more stories of hit squads roaming about to pick and to punish arbitrarily. I am sure, the organisers were inspired by the Arab spring. This uprising in the Middle East astonished the entire world when a volcano of human patience erupted there, taking start from Tunisia this wave of change took the neighbouring countries into its folds. In the case of these governments they were monarchies, sheikdoms or some other forms of oppressive dictatorship. Such a situation does not hold in Sri Lanka today. People in our island are conscious that there is a way to throw out an unpopular government. Janabalyas aren’t wanted unless to press for enterprise-level micro demands. Thus ended a rally that wasn’t wanted by the people in the first place. The parallel to the Arab Spring stands by contrast and not by any similarity. The video of the youngster, fully intoxicated and fallen by the wayside pains my mind and reminds me of the callousness and heartlessness of projects like this led by politicians for the politicians.